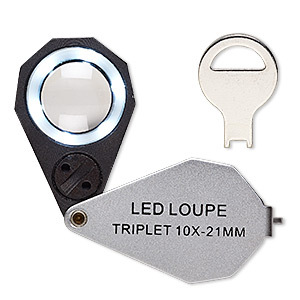 Loupe, 20x power with light, plastic / glass / stainless steel, black, 85x26mm (when open). Sold individually. Item Number: H20-4948TL Have a question about this item? 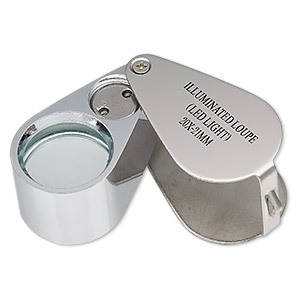 With this lighted loupe, you enjoy clear illumination of gems or jewelry you're inspecting, no matter what the lighting is around you. The large 21mm diameter lens features 20x magnification with two built-in white LED lights and an on/off switch. 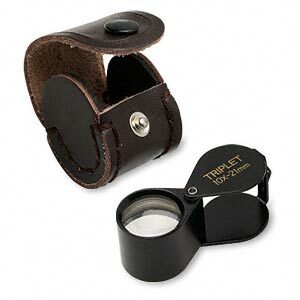 Fold loupe to protect lens when not in use and for compact transport. Three replaceable LR927 batteries included. 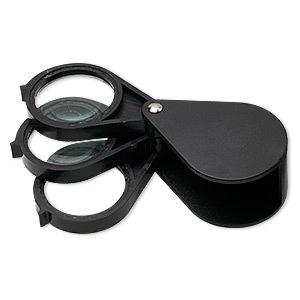 Loupe, Grobet USA®, 10x power with light, glass / steel / plastic / imitation leather, black, 3-1/4 x 1 inches open. Sold individually. Loupe, 5x to 15x power, plastic / glass / steel, black, 4x1-1/2 inches (when open). Sold individually. Loupe, 20x and 10x power, steel and glass, 91x21mm (when open) with acrylic case. Sold individually. 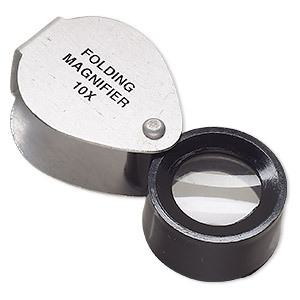 Loupe, 10x power, metal and glass, 2-3/8 inches (when open). Sold individually. 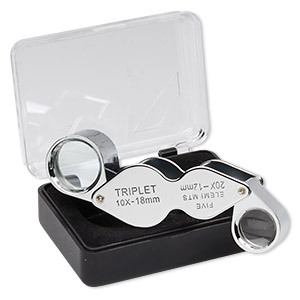 Loupe, 10x power, aluminum / stainless steel / glass, 2-3/8 inches (when open) with leather case. Sold individually.